When author BJ Knapp dropped into Susan’s inbox, asking if Jett or I would like to review her book, Beside the Music, I laughed. Jett had already done it. So I sent her the link and asked if she’d like to write a guest post. I checked with Jett about some topic ideas, ran them past BJ, and here we are! 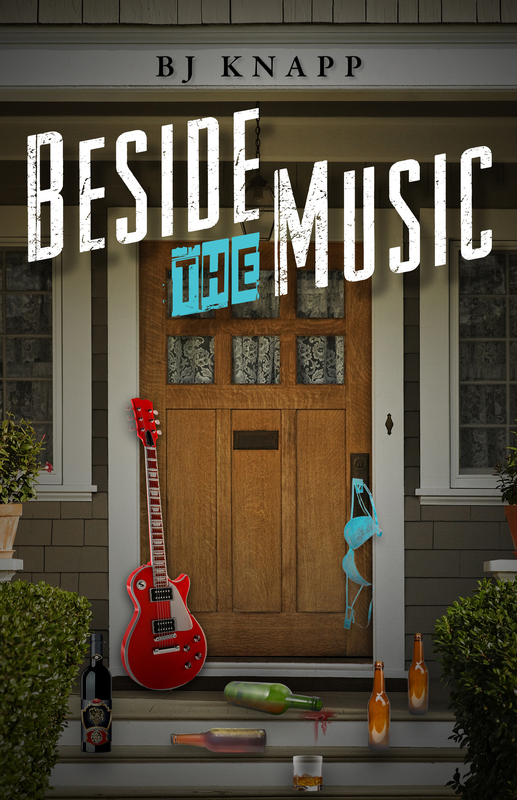 Some words about Beside the Music, which Jett thought was worth a read, but I suspect I might like more, especially after reading this. I hope you agree; buy links are at the bottom! Beside the Music was born out of a day dream. I often wonder whatever happened to those ‘80s one hit wonders. Sure, when they were on top they were living the high life. And they spent like the money was falling from the sky. The fast cars, the mansions, the hot tubs and the parties where they practically swam in cocaine. At some point somebody had to tell them that the money was gone. A meeting was called. The rockers strolled into a conference room wearing the eyeliner and the leather. A manager or an accountant told them that the money was gone. Then what happened? Did the rockers freak out? Did they demand more money? Did they give up and get office jobs where they sat in cubicles and worked at repairing copy machines? Or did they fight it out and try to re-invent themselves? I wanted Hydra to try and re-invent themselves. But I wanted them to be clueless as to how the real world functions. They’ve been sheltered behind their managers, assistants and roadies. I originally had the scene where Hydra learned that the money was gone in the manuscript. But it didn’t work with the first person perspective from Brenda’s point of view. I tried for a shifting perspective, but I just couldn’t get it to stick. So I had to ditch the scene where the band comes up with the idea for re-invention. Brenda had a colossal crush on Keith when she was a teenager. Keith was one of the founding members with his best friend from grade 9, Ben Taylor. I named him Keith Kutter for a few reasons. One is that Keith is such a rock star name. You have Keith Richards…. You have Keith Moon. Two is that Keith is the kind of name that can be said with a sigh as you are daydreaming about a rocker thrusting to the beat into his electric guitar. Try it. It totally works. You can’t sigh a name like Herbert in the same way. I never did come up with Keith’s given last name. In the book he’s Keith Kutter. I wanted to put in umlaut over the u in Kutter, but Microsoft Word wouldn’t let me. (Fricken Bill Gates, thinking he can just take charge of my characters and their umlauts. The nerve of that guy!) But Kutter, with the K, even without the umlaut, is such an ‘80s rock kind of name. Addiction is, unfortunately, common in the rock and roll world. A great deal of talent was destroyed by overuse of drugs and alcohol, and Keith was no different. However Keith’s addiction was not a result of backstage peer pressure. His was caused by a drunk driving accident, which was entirely his fault. As a result of the accident his son was rendered a quadriplegic—he eased his guilt by raiding his son’s medications. His addiction ended his family, but not his career. His wife Tamsen threw him out, and he dried out by taking off on his yacht to detox alone while at sea. He still has an issue with alcohol, but he managed to ditch the pills. In the book he spent quite a bit of time passed out on Brenda’s couch, until her mother in law woke him by beating him over the head with her Hermes Birkin purse. To Brenda, Keith is a fantasy. He’s not the main love interest because love with Keith is not real, and Brenda wants a real life and a real love by her side like she has with Tim. The love that a fan has with a rock star is distant. Fans don’t know what the stars are really like. Sure, we watch them on stage, observe them in interviews and read about their lives in the tabloids. But so much of that isn’t real. And she learns a bit of what he’s like when she first has dinner with him. She watches him throw his weight around and demand the expensive bottle of wine. But then he softens up a bit at the end of dinner and they end up having a lovely time once Keith gets over himself a bit. The character of Keith must change over the course of the story, and it does. He learns to lighten up. He takes his ivory tower rock star persona very seriously, but he does change with the help of Brenda and Tim. Wow! And I totally need to read this, just to see this scene with the Hermes Birkin purse. Pick up your own copy at Amazon or Barnes and Noble (You iBook lovers may need to search the store. Those access links confuse me! ).